This fine antique Victorian sterling silver christening mug has a cylindrical tapering form. 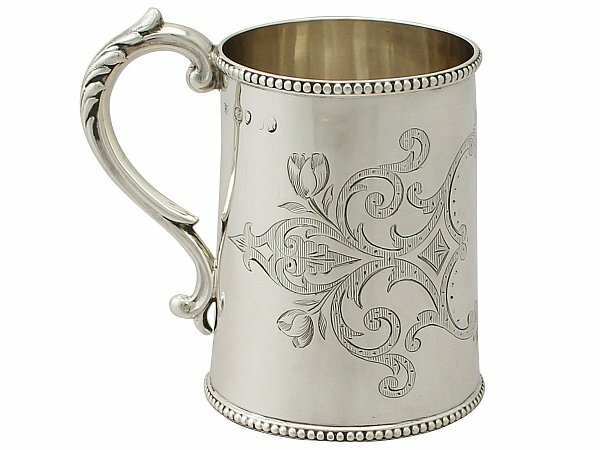 The body of the antique silver christening mug is ornamented with a fine and impressive bright cut engraved scrolling motif accented with floral bud ornamentation. The decoration to the body incorporates a scroll and leaf motif bordered, shaped vacant cartouche to the centre. The upper rim and base are encircled with fine and impressive applied bead decorated borders. The antique silver christening mug is fitted with an impressive S scroll handle with chased leaf decorated thumbpiece and a bifurcating lower terminal. This antique christening mug is a very good gauge of silver, excellent quality and in exceptional presentation condition. Full hallmarks struck to the surface have wear in keeping with age and location, but remain legible. Length from back of handle to rim 8.7cm/3.4"